Barcelona - Spain a top European center for art, architecture, design and cuisine, this stylish city has its own language and culture. The soul of old Barcelona is its Gothic Quarter; outside the medieval district, discover iconic landmarks and more. 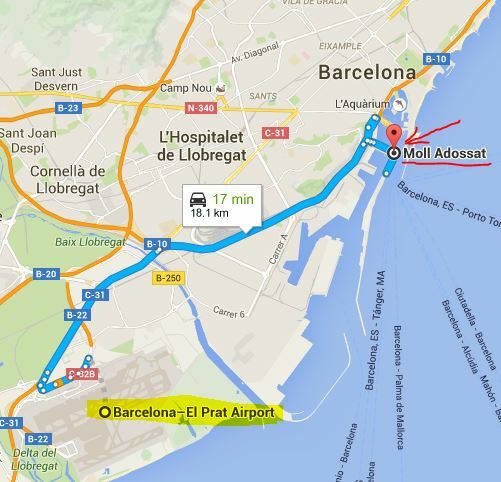 The distance from Barcelona Airport to Barcelona Pier is approximately 15 km. Many of the cruise companies recommend this as the easiest way to travel to and from your ship from the airport. 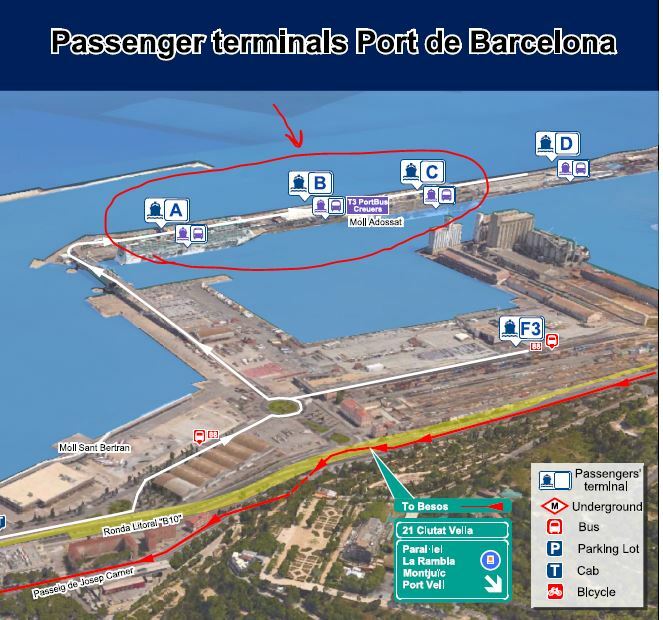 There is no direct train or coach transport from Barcelona airport to the port. It is for this reason that taxis are often recommended for those travelling on cruise ships. Book your parking space in Barcelona right at WTC Barcelona and enjoy your cruise without a care in the world. As the name suggests, The Grand Marina hotel is in the marina area of Barcelona, near to where the cruise ships dock. From the hotel you will have views of the Marina and Port Vell which is adjacent to the tribute to Christopher Columbus - Colum. It is located on the Famous Ramblas in the heart of Barcelona city centre. The big advantage of staying at Le Meridien hotel is its location. As soon as you walk out of the hotel door you are right in the middle of where all the action is. You have Plaça de Catalunya only a few minutes walk away with some fabulous shopping all around that area. This hotel is only about 15 minutes walk to the Southern most end of the Ramblas. This is a recent addition to Barcelona's hotel portfolio and is a real hidden gem in the labyrinth of the Gothic quarter - the historic barrio. Due to its privileged location the Neri is a secret to all but those in the know. It's definitely worth being in the know because the Hotel Neri is a near perfect hotel. The first thing you will notice about this hotel is its impressive façade, Art Deco in style, towering over La Rambla. The location is paramount, a 5 minute walk from Plaça Catalunya and 10 minutes into the heart of the Barri Gòtic and the Barcelona cathedral. It is a pleasure to walk off the busy street into the heavily chandeliered, Art Deco feeling lobby of the Hotel Gotico Barcelona. Located in central Barcelona, in the Gothic Quarter, and offers comfortable accommodation for all types of visitor to Barcelona. While you're in Barcelona, don't miss the Picasso Gallery. Several adjoining 15th-century palaces house a huge collection (over 2,000 pieces) of Picasso's work. Stroll along Las Ramblas, a wonderfully vibrant part of the city where street vendors and performers vie for your attention. Explore the many churches and cathedrals of Barcelona and discover the city's modernist architecture along Paseo de Gracia. Visit Antoni Gaudí's unfinished Segrada Familia. With eight soaring spires and a spectacular main façade, this cathedral is a true architectural masterpiece. Don't miss paella, the Spanish national dish. It's a delicious combination of seafood, chicken and vegetables mixed together with saffron-colored rice. A valid Passport or National ID card. Schengen Visas - for Entry to the European Union for Applicable Nationalities. Guests who are not US, Canadian, or European nationals are strongly encouraged to contact the nearest EU-member country embassy to determine if a Schengen visa is necessary. It is the responsibility of the guest to identify, obtain and present necessary visas before the start of their cruise vacation. Requirements vary based on the guest’s nationality and countries visiting during the cruise. Evidence that you are funding the cruise, through a bank associated with a non-sanctioned country. You must be able to satisfy all of the above criteria in order to sail on board this sailing. Season 2019 - Let's join together and discover the Middle Eastern world of talent, music, dance and adventure, Stars on Board style! Treat yourself to a breath taking cruise vacation, aboard the magnificent Norwegian cruise ship PEARL by Stars On Board. Drop us a Mail: info@starsonboard.me - Call: + 1 (416) 251 5097 or +1 647 983 9795 on WhatsApp for inquiries. * Disclaimer: The information posted above is for indicative purposes only; Stars on Board is not responsible in any way for the accuracy or the up-date of the above data.